Well, Red Dead Redemption 2 is out today! Rejoice and lose yourself in that wonderful recreation of the Wild West through the weekend. But once next week comes about and you need to leave your comfy gamer den to do your daily tasks (responsibilities, bleh! ), you might find yourself itching for some cowboy action, but with no console on hand to scratch it. Fear not, you do actually have a console on you at all times. Yep, your smartphone! 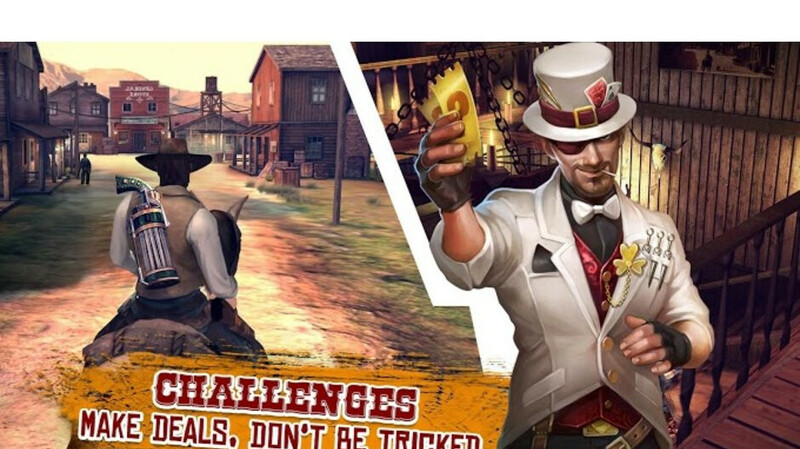 And, wouldn't you know it, there are a few Wild West-themed games out there that might scratch that itch for just long enough before you manage to get home and pick up the controller once again. Let's check them out! Made by popular developer Gameloft, this game ticks a lot of the right boxes. First of all, it actually has a story and it revolves around a gruff-sounding, no-nonsense, gun-slinging bad boy. There's a huge map to explore and — of course — you can do it on horseback. Well, the game does take a slightly supernatural turn, so that might not be your cup of tea. But hey — cowboys and revolvers! Not to mention, there's multiplayer with ridiculous weapons as well. Now, it's a free to play title, which means it'll try to milk some cash from you via in-app purchases, but at least you can download it and try it out at absolutely no cost. This is a top-down isometric MMORPG, which throws you in a Wild West-themed world and expects you to survive. The game features elements such as mining, hunting, crafting, and base-building. Of course, there are also gunfights when thieves try to take what is rightfully yours, and you can even have Mexican standoffs. This is a really short, tap-based rails shooter. It's basically a revenge story where our protagonist sets off to kill 4 gang members who have wronged him. The gameplay is pretty simple — when you see enemies, time slows down, and you have less than a second to tap on your opponents. Once time starts up again, your hero will decimate your foes. So, not a lot of gameplay there, but we found ourselves having fun with it none the less. A great time-burner when you have some minutes to spare. The game is also available on iOS, but the developer hasn't updated it in a long time, so Apple doesn't deem it compatible. Bear with us, now! OK, so Oddworld's Western Mudos is not exactly planet Earth in the late 19th century — it's a mixture between steampunk, crazy alien world, and the Wild West. Stranger's Wrath is a game that oozes with the gun-slinging outlaw feel, even if its setting is a bit extraordinary. Still, you play a grumpy bounty keeper out to catch bad guys with a huge map to explore and lots of locations to visit. Yeah, your guns might fire bugs instead of bullets, but it's still gun-slingin'! I have played six guns. Okay at best. Wait....so are you telling me that there aren't ANY Red Dead games that look AMAZING on the ROG or Razer or Black Shark or..(Insert gaming phone here) ? Don't know about others but oddworld stranger's wrath is the best, Six guns is also good.